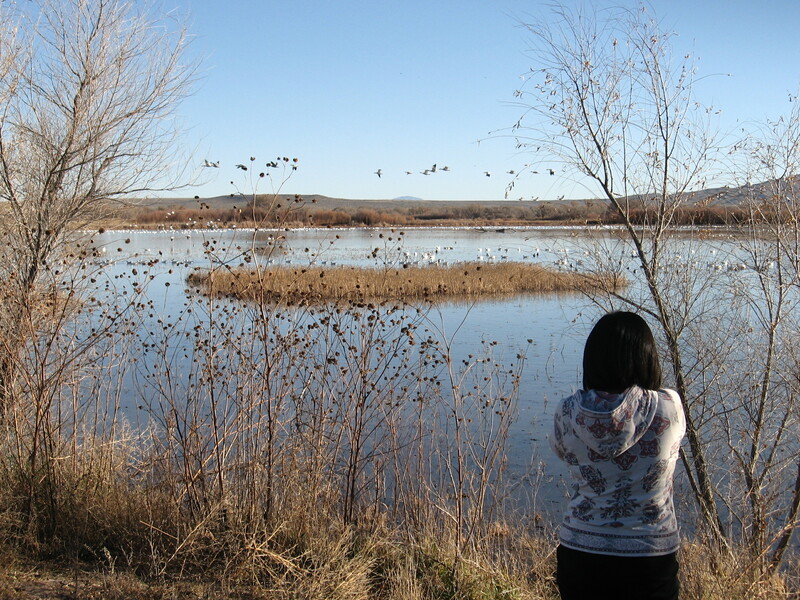 Mai and I went down to Socorro for the weekend to visit the Bosque del Apache Wildlife Refuge. It was beyond imagination. 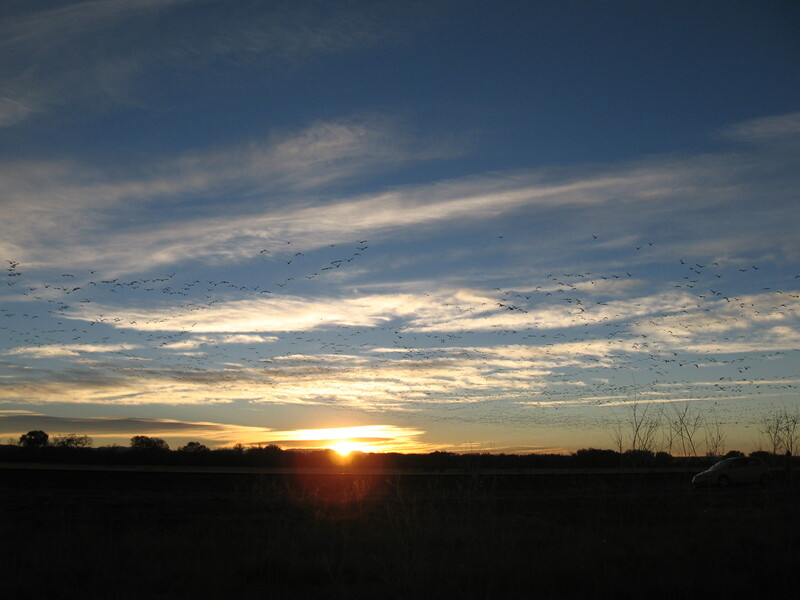 We spent the night in Socorro and watched the fly ins and fly outs at sunset and sunrise. Just spectacular. I’ll definitely supply a link to Mai’s galleries. For once I was wishing I had a better camera. Mai’s photos are awesome. For now here are mine. 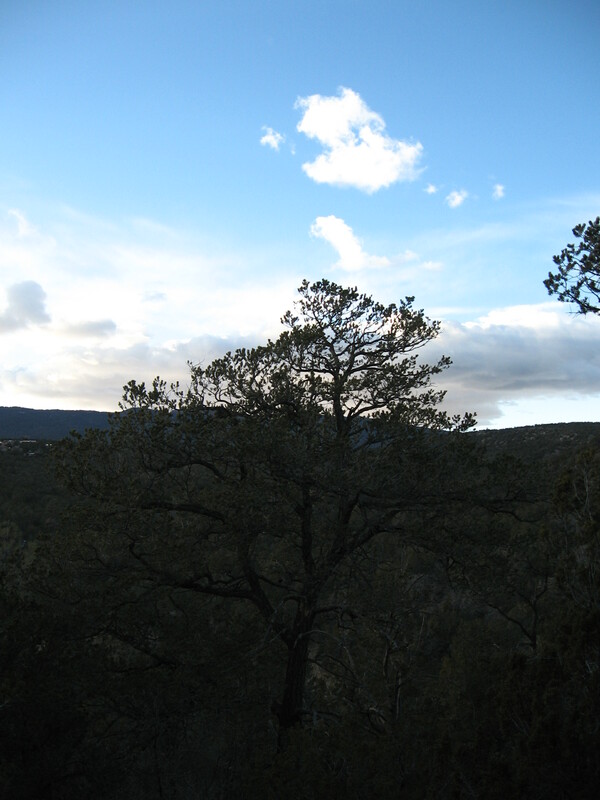 I knew Northern New Mexico was outstanding, but I had no idea I’d love Socorro so much down on the old Camino Real. 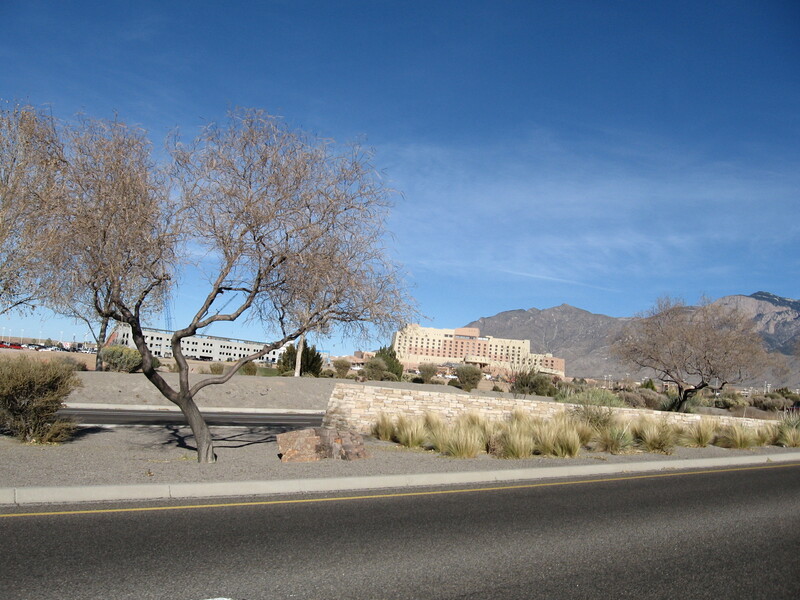 The creosote bush exudes the warm astringent smell found in the Chihuahuan desert. Sublime. 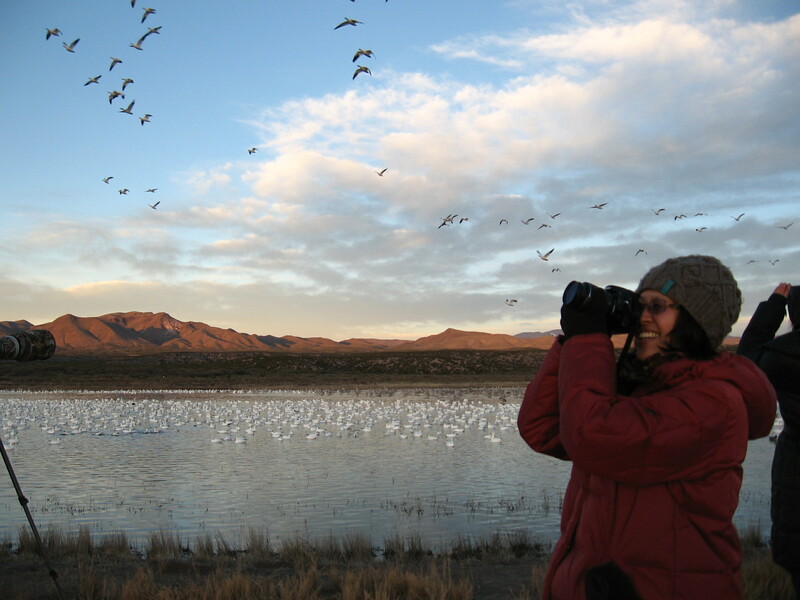 The bird counts at the refuge are enormous. 10,000 Cranes. 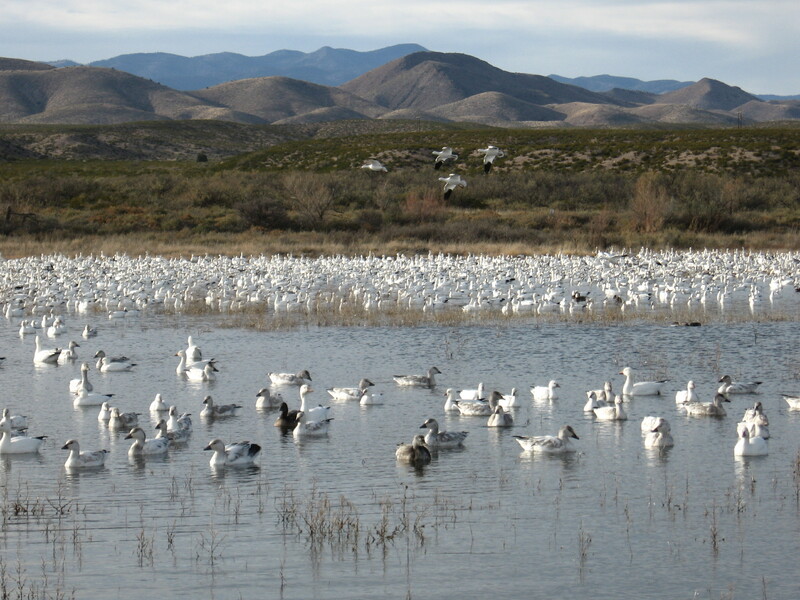 40,000 Geese. 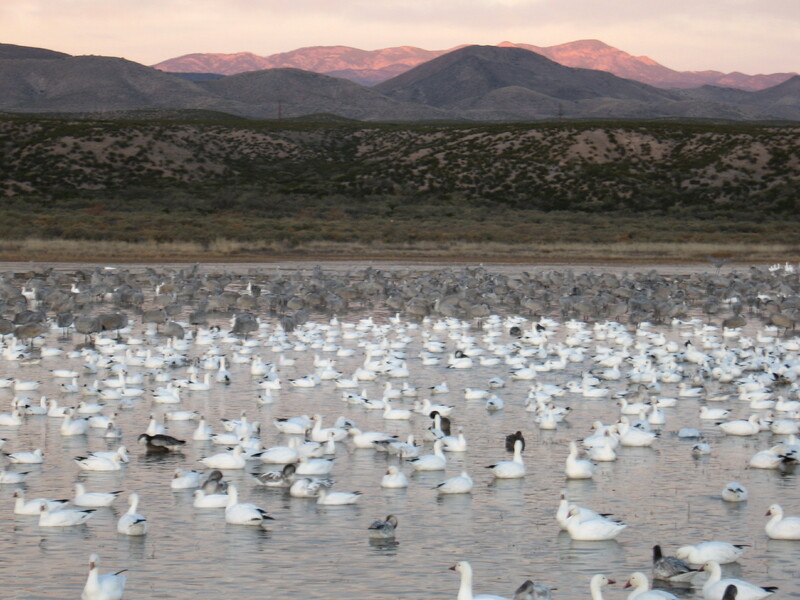 70,000 ducks. 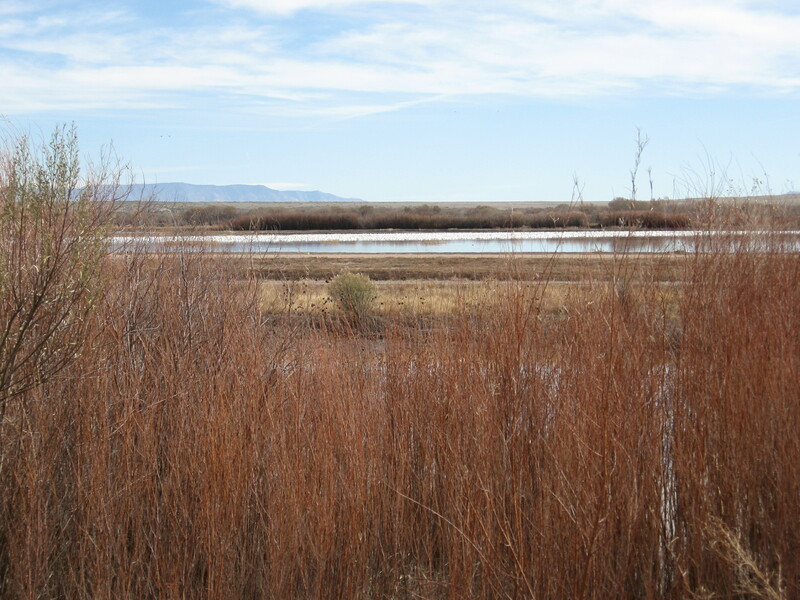 The visitor center and field staff at the refuge are happy & helpful. The bird outlines against the marbled blue and white sky soothed the soul. 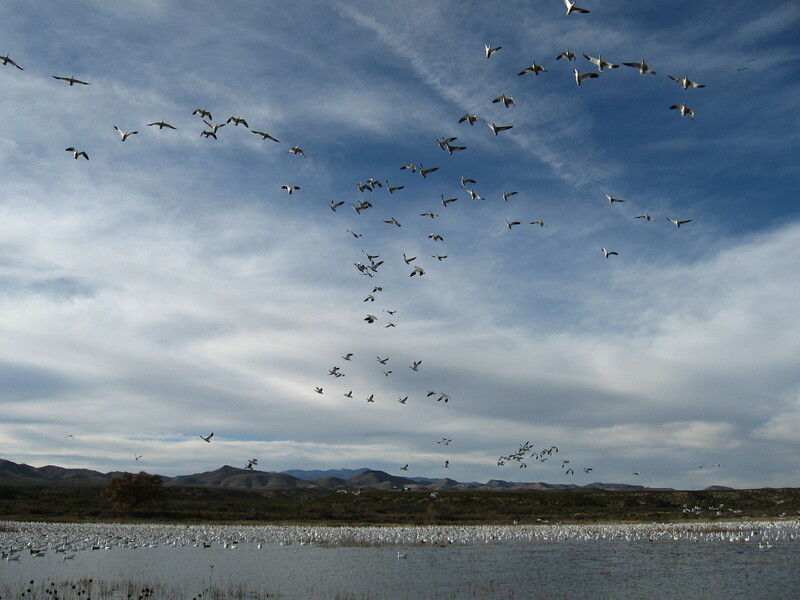 The aural landscape of wind swooshing with wing flaps and bird talk high above overwhelmed my senses. 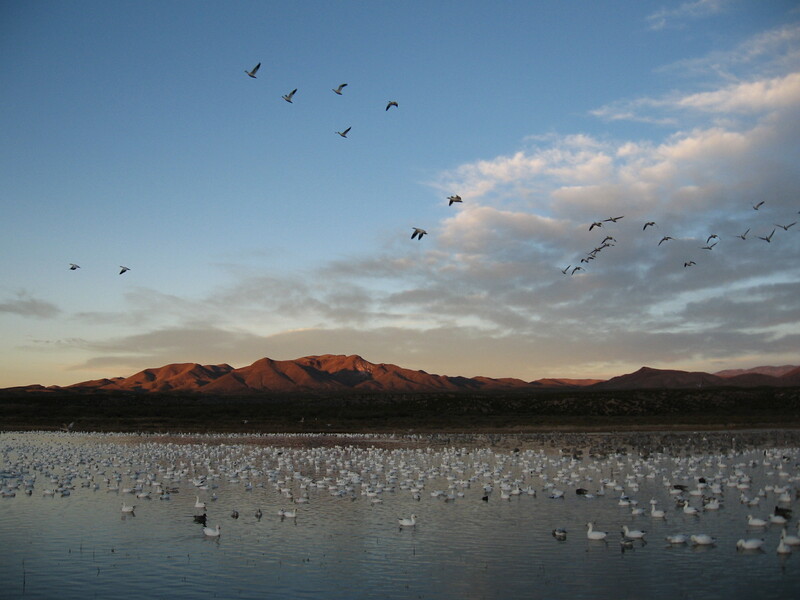 I read a quote from Charles Kuralt about how his first visit here resulted in the birds and place entering his soul. For me something inside was awakened, ancient connections to a world that knows no nationalities or socio economic status. A world of pure belonging and being. The real world. this road is closed to motorized traffic. The biologist said there were elk here but they must have been bedded down. They are here for the food. We saw raptors soaring. This place is a perfect example of the other American experiment that’s going on. The first experiment is seeing how we human beings fit together in a multicultural setting. The second experiment is how we human beings fit into the natural order. A different kind multiculturalism we must blend back into. This graceful dance of life oh what a show. 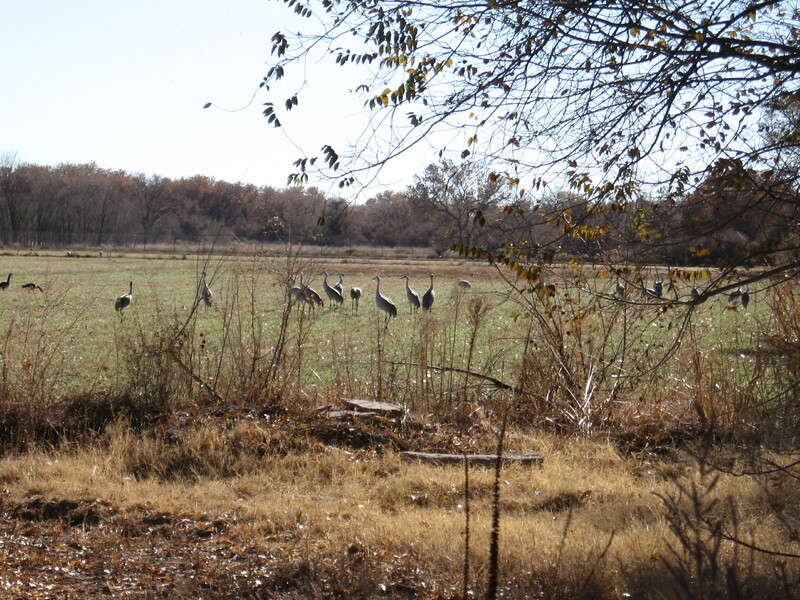 This entry was posted in Wildlife on November 30, 2014 by bikeyogiblog. Gratitude Rides and ¡Buen Provecho! We had our best Thanksgiving ever this year. 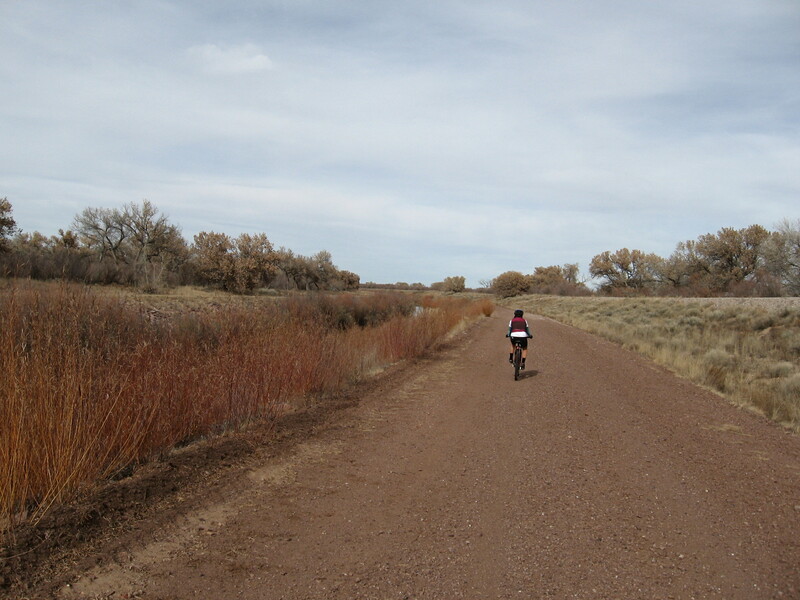 To kick it off Thursday Mai and I rode the Bosque Trail from Tingley Park and did the loop in the South Valley. 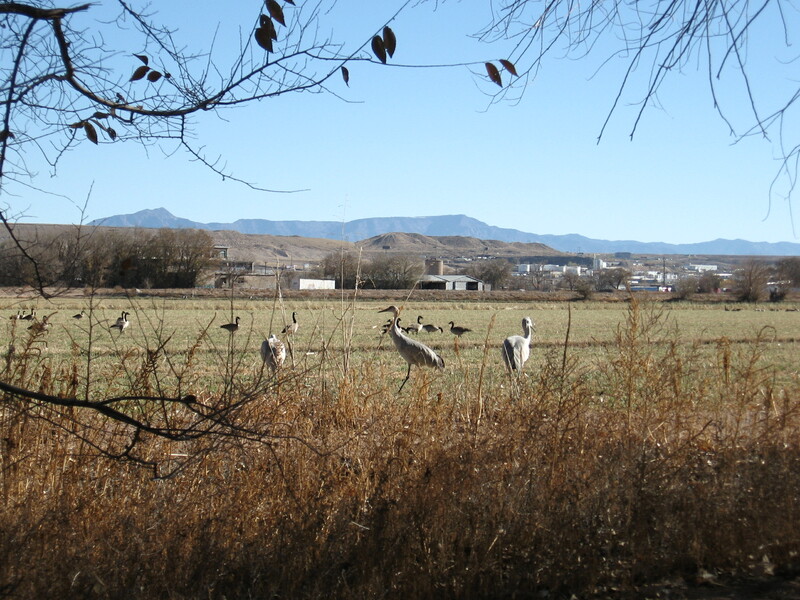 Past the National Hispanic Cultural Center the riverside is complimented by open fields filled with geese and Sandhill Cranes. We were pretty awestruck. 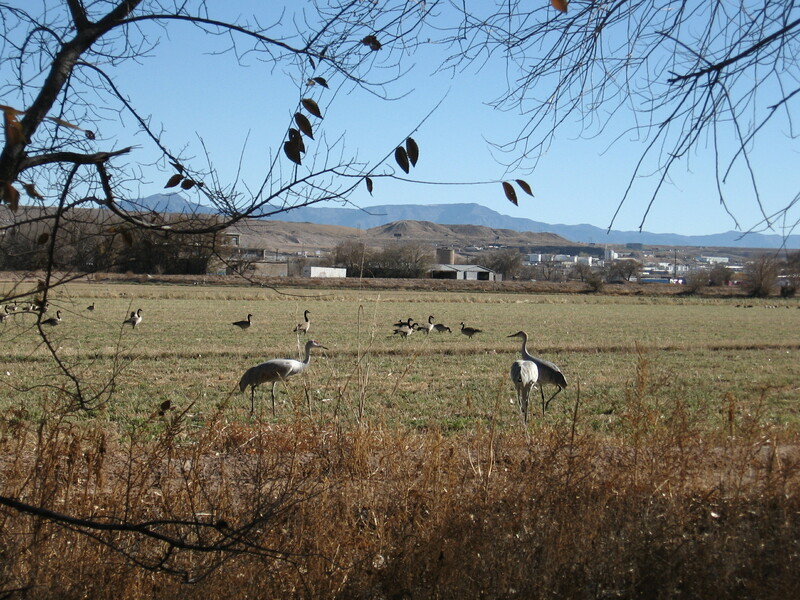 These friends from the eons will be with us in Albuquerque through late winter before they migrate onward. We saw quite a few cyclists, roller bladders and runners swing by us while we watched birds. Most paid attention, but a few seasoned locals zoomed straight on by. 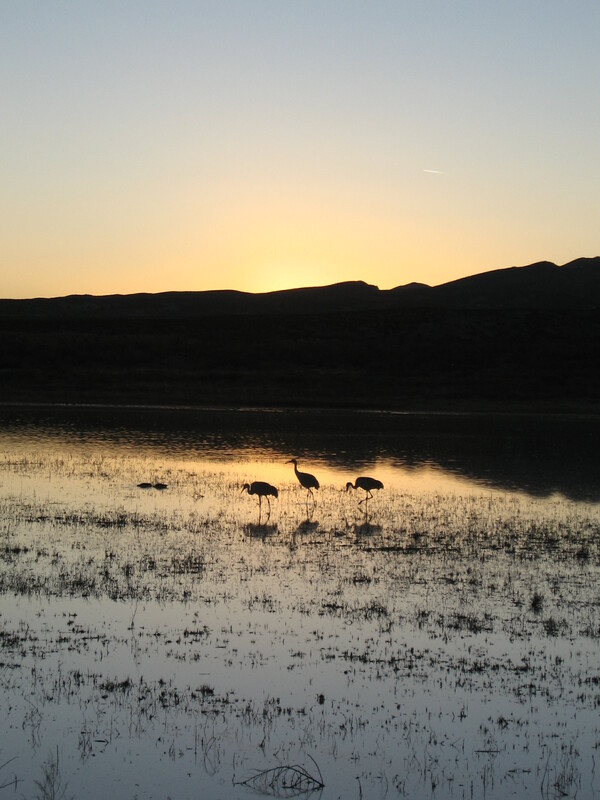 I don’t think I’ll ever tire of the presence of this bird life just as I never bored of the regular deer and elk sightings we made in the high country of Arizona. Awesome. Our ploy to stimulate sufficient appetites for dinner worked well. We shared Thanksgiving with new friends at their home on Adams Street a few blocks from the University. They cheered me up with refreshing conversation on their bike commuting routes to work and school and their optimistic and open minded bent on the possibilities for a more bikeable and walkable city culture. Commuting by bicycle reduces stress and parking is cheap. When you live close to your everyday destinations in a city with 360 bikeable days per year, bike commuting is a natural and nimble way to get around. A healthy pleasure. The dinner was over the top outstanding! Our hosts told us to wear comfortable clothes and bring tupperware. As I filled my plate for seconds it became apparent the loose fitting clothes allowed my belly to become living tupperware. People laughed at me, as usual. We also came home with full containers from the festive abundance. Today all gone. Ridiculously good! To top off the celebrations today I rode with three friends around the mountain via the Hagen road. On that road you ride into these multicolored rocks of reddish brown and charcoal hues. Up against the deep true blue sky you sense the presence of eternity. My companions were so good on the twenty mile dirt stretch I didn’t see them even on the distant horizon. As I plodded away through the sandy pits walking my bike along with my cleated shoes I couldn’t find another foot imprint on the ground, only three sets of tire tracks. Those guys are bike ninjas. Much respect and gratitude that they waited for me to immerge from the desert road and home we went together. 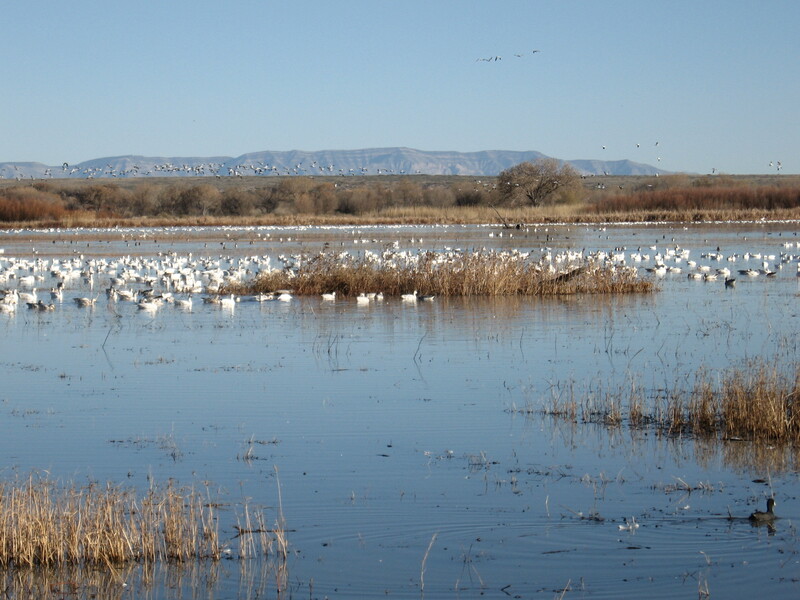 The birds and fields, river and open spaces, people and food here are building up a sense of place and concrete community in my life, a distinct and relaxing peacefulness resonating from a deep feeling of being at home. Querencia. 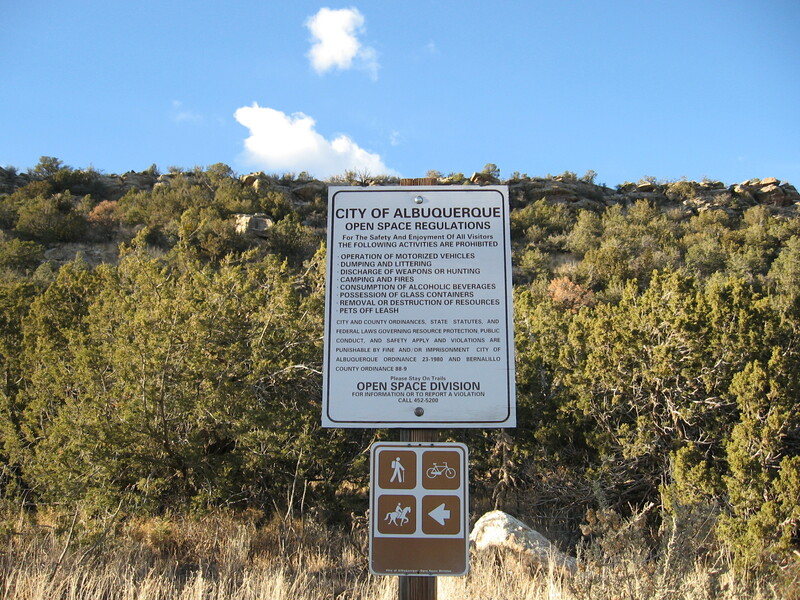 This entry was posted in Albuquerque, bicycle rides, Uncategorized on November 28, 2014 by bikeyogiblog. The journey we take biking outside always has a parallel pathway within. Sometimes the biggest discoveries come through the toughest moments. I remember moments of deep doubt during races when the race dictated a question I did not know the answer to. You utilize the pressure to concentrate your efforts and find out what you can do. Once in a great while you’ll get a revelation. By definition you arrive there from a dark and mysterious place. That is how it has to be. Taking on a challenge helps us tap into a resource, a wild area within us, that was uncharted territory. These kinds of discoveries can make us feel so alive. There are also more mundane ways living with the bike makes an equally big difference. For ten years I lived without owning a car. Paradoxically I found this liberating as I was continuously surprised at how much I could get done on my bike and walking. More than I knew was possible. It was the difficult circumstance that helped me discover my fuller potential. I must admit even though I didn’t own a car for ten years I rented one whenever I wanted to take longer trips. It’s this moderation and balance of living comfortably but also challenging myself that bicycling allows me to do. This holiday season I’m grateful for what I’ve been able to do, and can hardly anticipate what my next adventures will be if I’m willing to forge ahead and try. That is excitement and the insecurity of living freely. Living by the bike certainly has helped bring out the heart in me. This entry was posted in exploring by bike on November 26, 2014 by bikeyogiblog. All Blue When we were first moving here Chris and Thomas took me on an after work ride down Diversion and up Tramway and La Luz. What a great way to cap the day. On the way home we took time to have frozen yogurt. I realized that day what a special bicycling place this is. 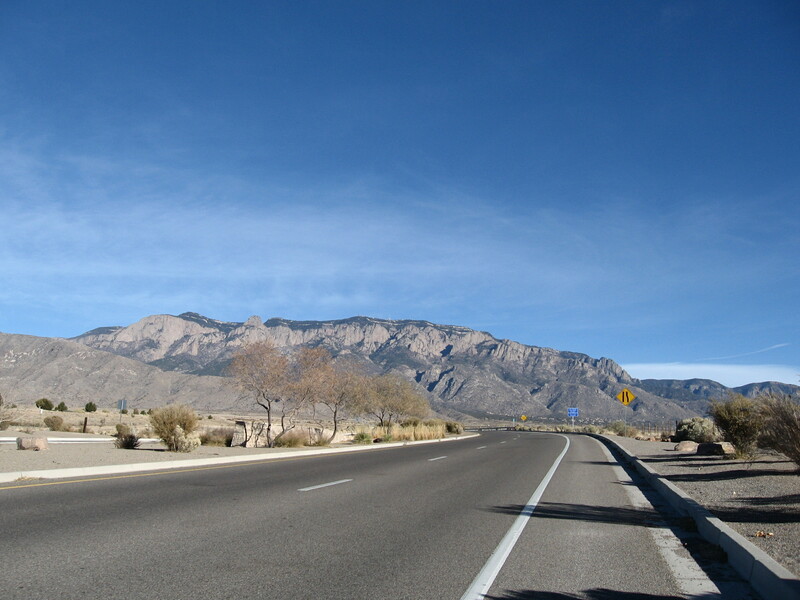 We have this gem of a climb on route 556 that starts near the traffic circle by the river, passes by the Sandia Casino, then veers left on Forest Road 333 (La Luz) for the final approach up into a little nook in the Sandia Mountains. 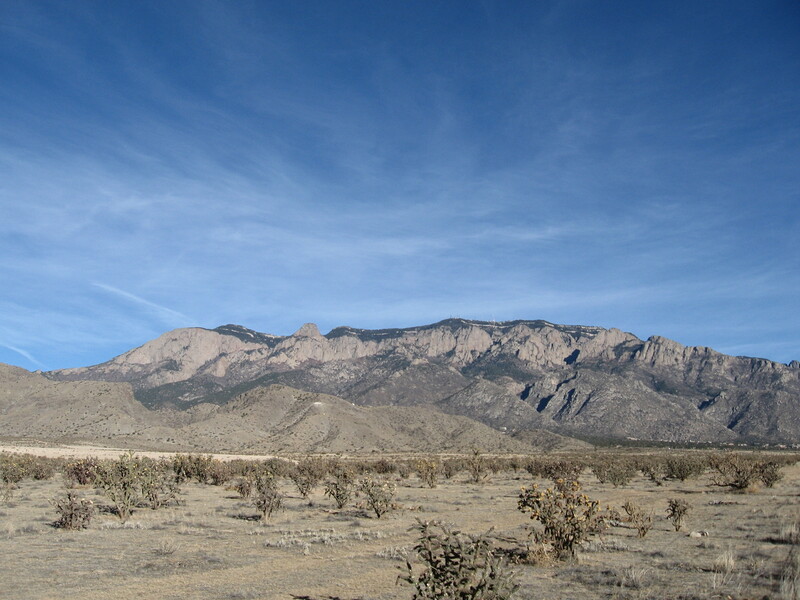 It gains about 2,000 vertical feet, is accessible from town, with beautiful views. It is a very special asset to the cycling community. 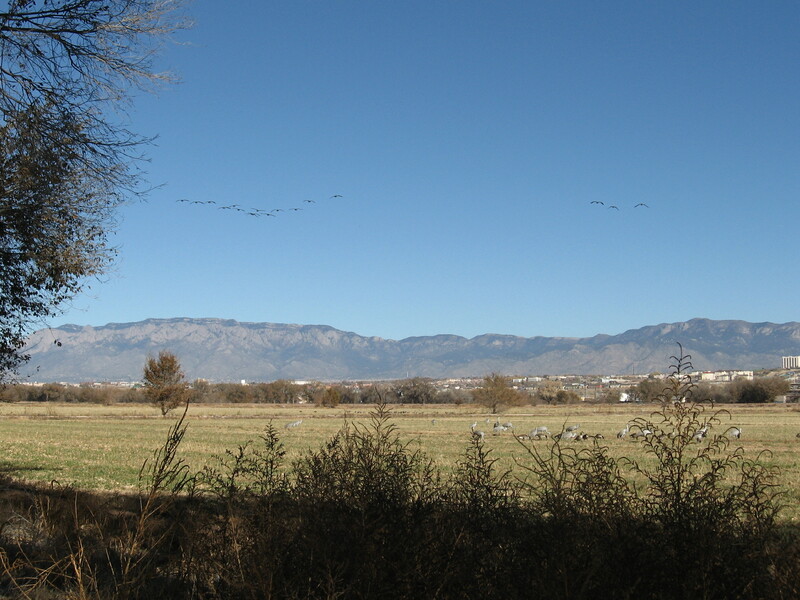 The Sandia Pueblo farms the riverlands. 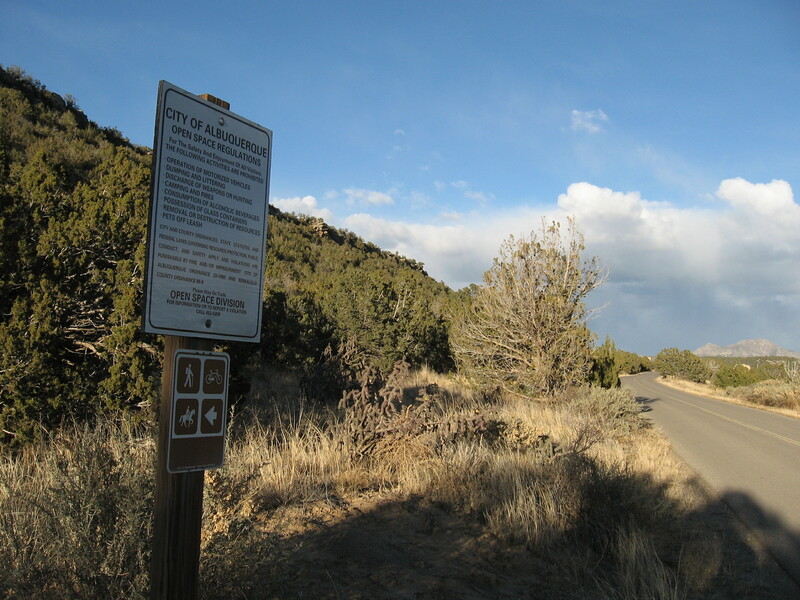 Looking northwest from Roy Rd. I think everyone visiting town flocks to this climb. 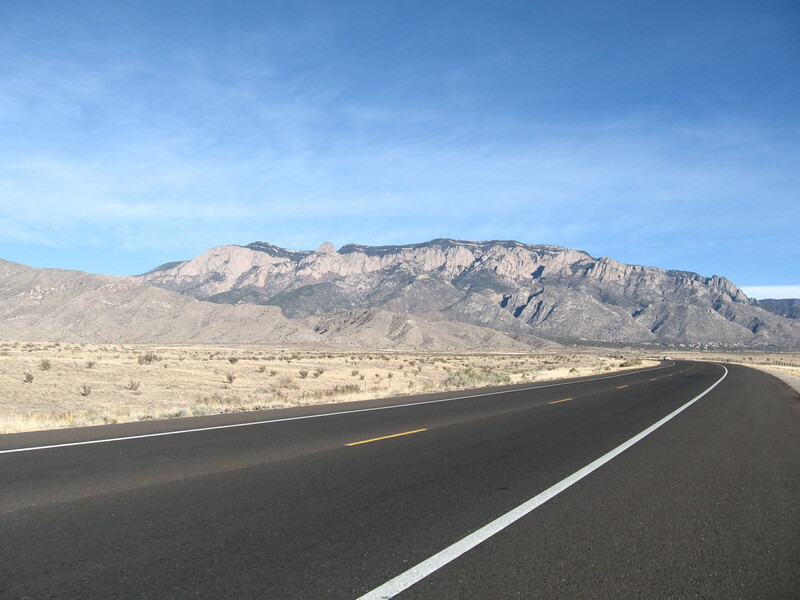 The Sandia Pueblo keeps abundant space open on the north side of Albuquerque so the road has expansive vistas. It is inspiring to ride. They did a good job on the shoulder. Thank you! It was 14 degrees this morning. These winter days make for clear air and incredibly blue skies. A long climb like this is a great way to warm up. Mai unpacked our rechargeable batteries, so now I have a steady supply of double A’s to run my camera. I set a new record taking almost 300 photos today. Got it down to 15 good ones for this blog post. Taking photos helps me see with precision. This climb humbled me today. I took a rest day yesterday and I was trying to gently rekindle the system. I definitely knew how I felt once I got into the top half of the climb. So I took it easy. 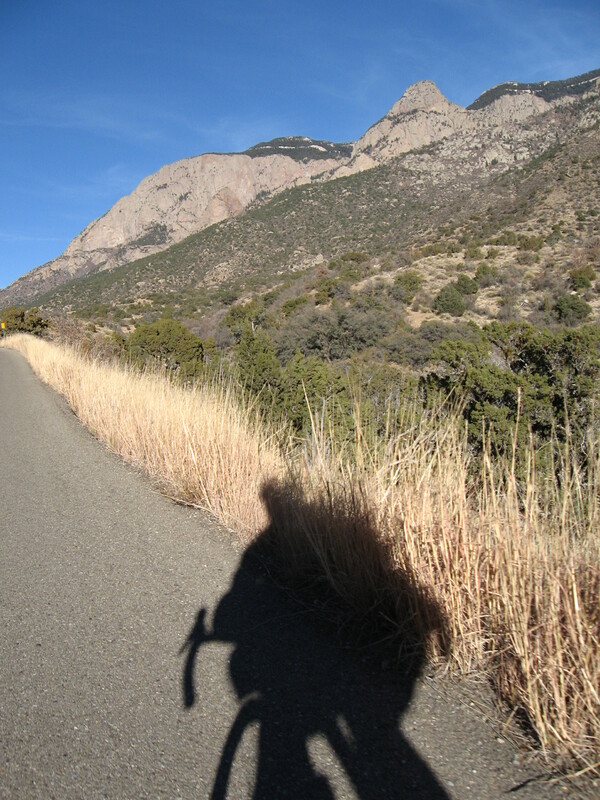 This entry was posted in Albuquerque, bicycle rides, climbs, training on November 25, 2014 by bikeyogiblog. 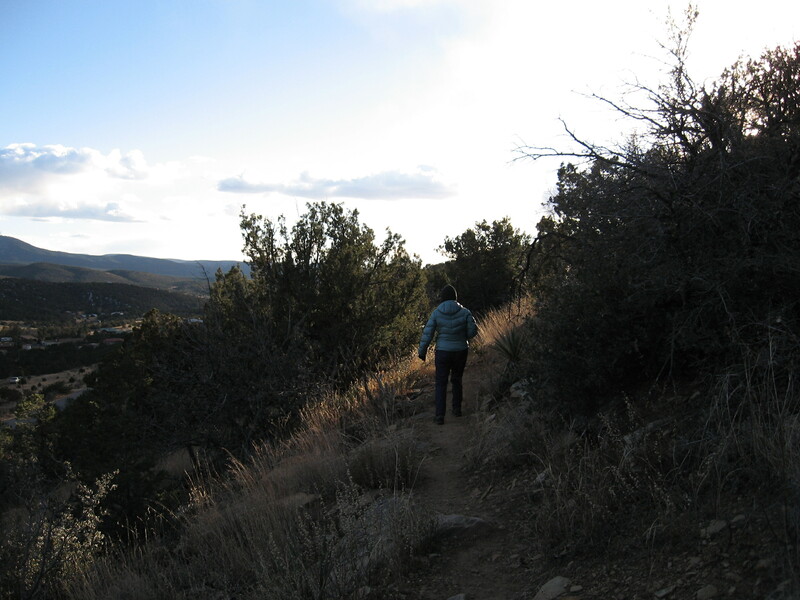 Mai and I took a walk on the far side of the mountains today at Albuquerque’s Open Space area in Gutierrez Canyon. I looked at my bicycling journal and saw I had ridden nine days in a row. Too many! I try to take at least one day off the bike every week. 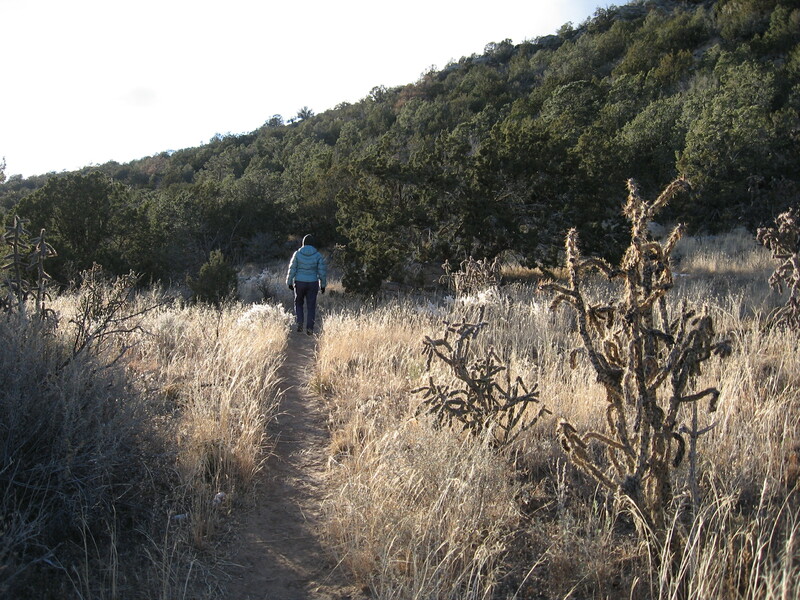 Taking a walk in a beautiful landscape seems to be one of the best ways to recover the body from bicycling. It was cold today and breezy. The trees protected us as we were hiking. 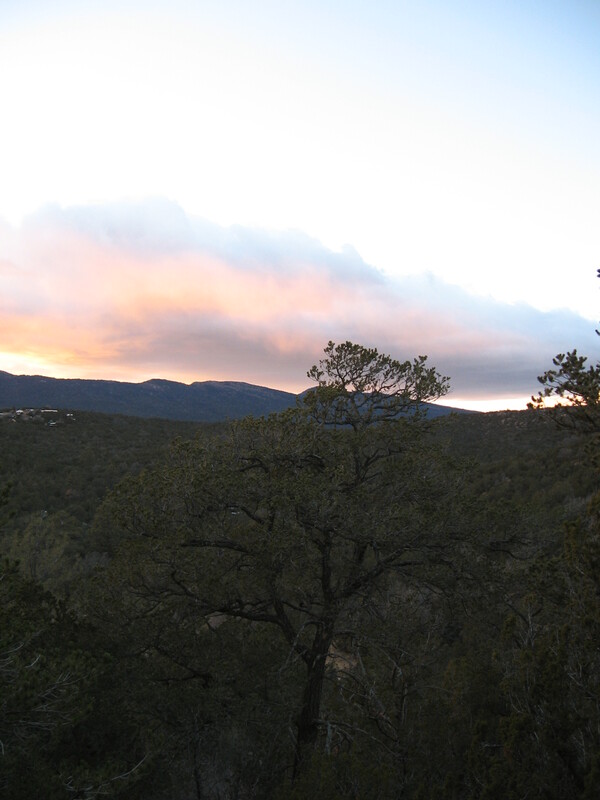 Grasslands fill the valleys and junipers, piñons, even ponderosas & oak swarm the highlands. Cactus all around. Sunny! I rode my bicycle out here yesterday. This is my favorite two hour ride. 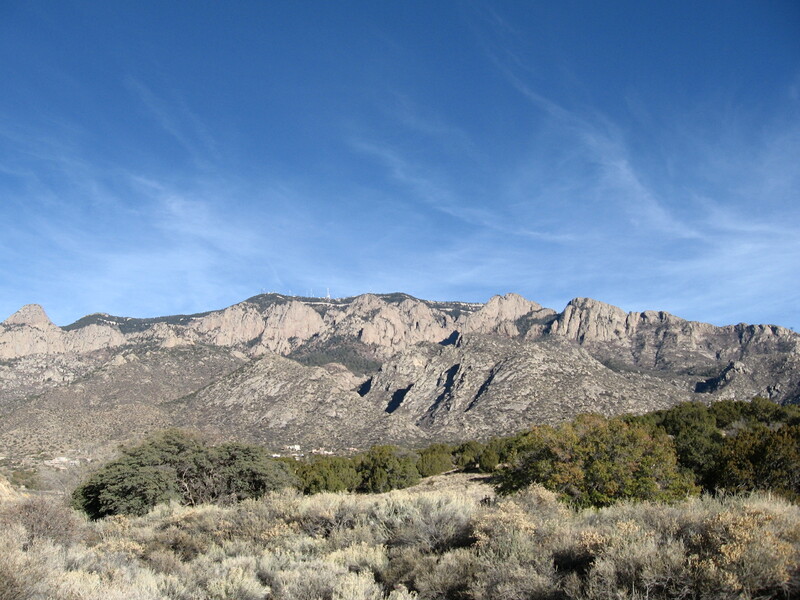 I live right near the I-40 multi use trail in Albuquerque that leads to the gateway to the east mountains area, Tijeras Canyon. 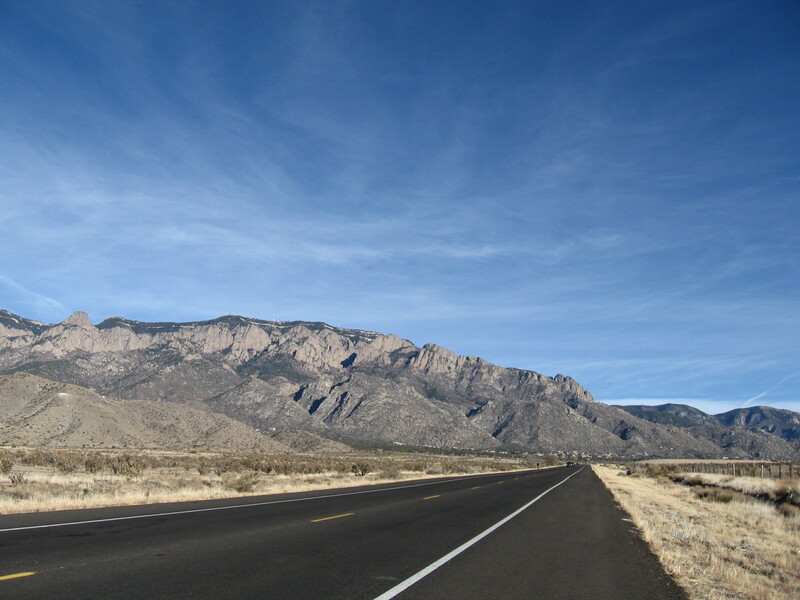 The I-40 trail helps me get out of the city with ease, and once past the Tramway/Central and Central/Four Hills intersections, its open road. 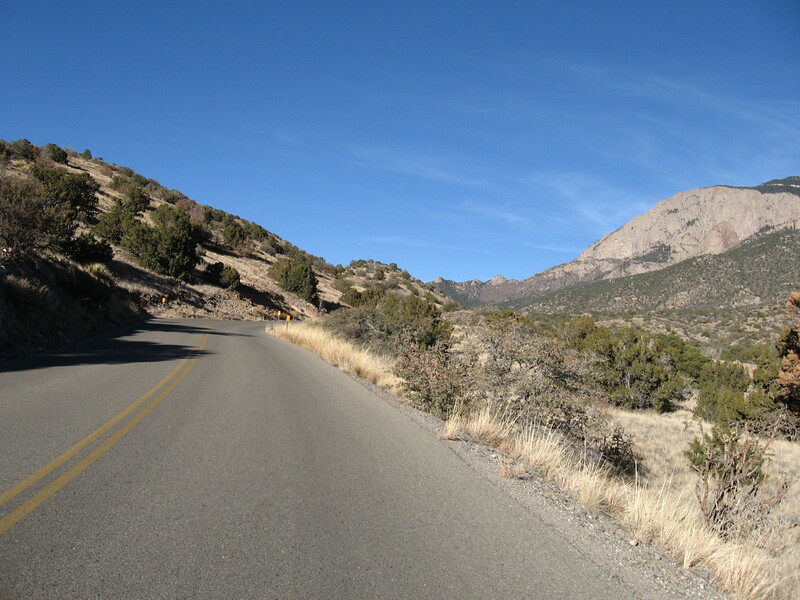 Amazing to experience the contrast of landscapes as I pedal through Tijeras and on to higher elevations in the east mountains. Oh the joy of the open road! 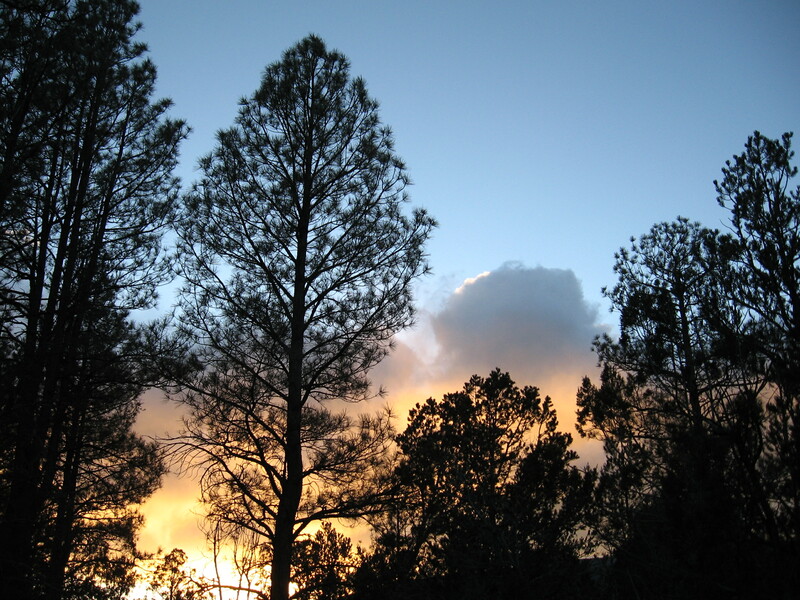 The invigorating mountain air is refreshingly clean with an astringent pine scent, pure, light, delicious to breath! The character and shapes of trees varies tremendously. Form changes with light. An infinity of unique moments. 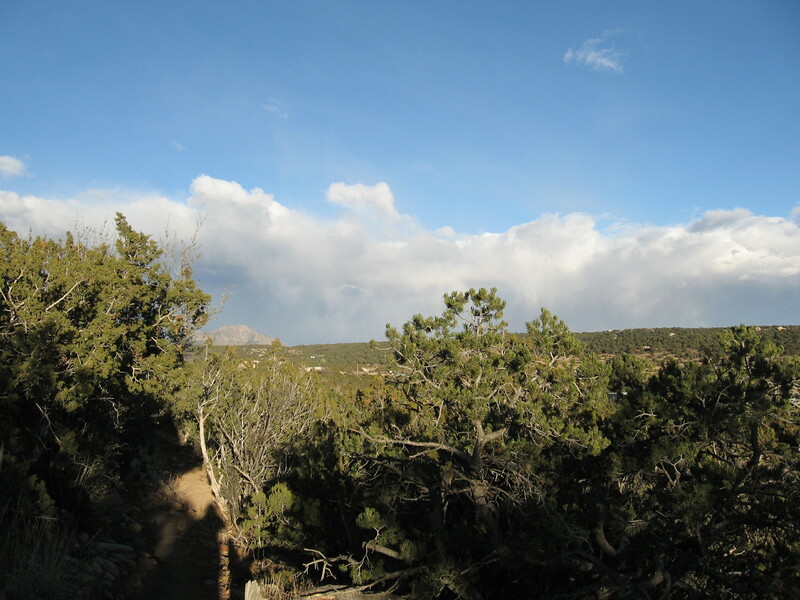 The trail begins around 6,700′ and there was snow on the ground in places. Over on this side of the mountains it is the mountains themselves that make me awestruck and humble. 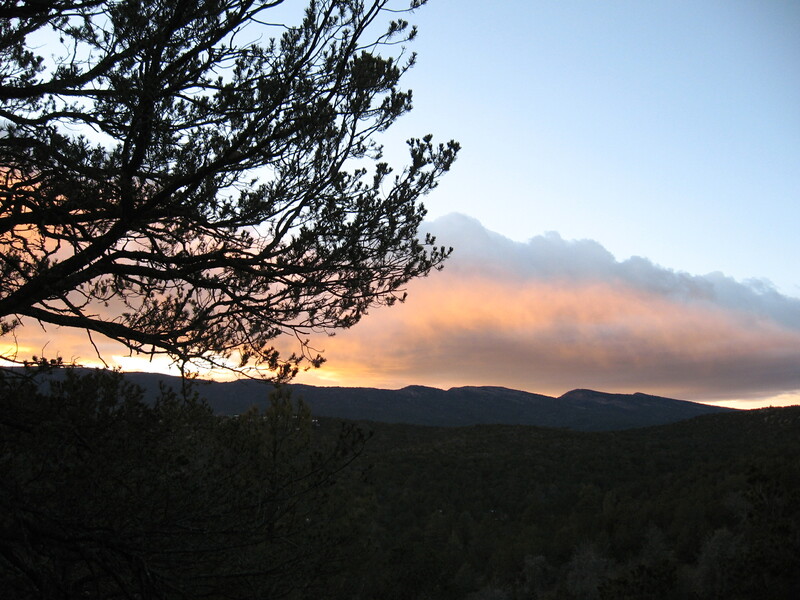 Over on the Albuquerque side in the high desert it is the expansive sky that makes it so magnificent. Now when I ride my bike down on the road below I have a better feeling for the shape of the land. 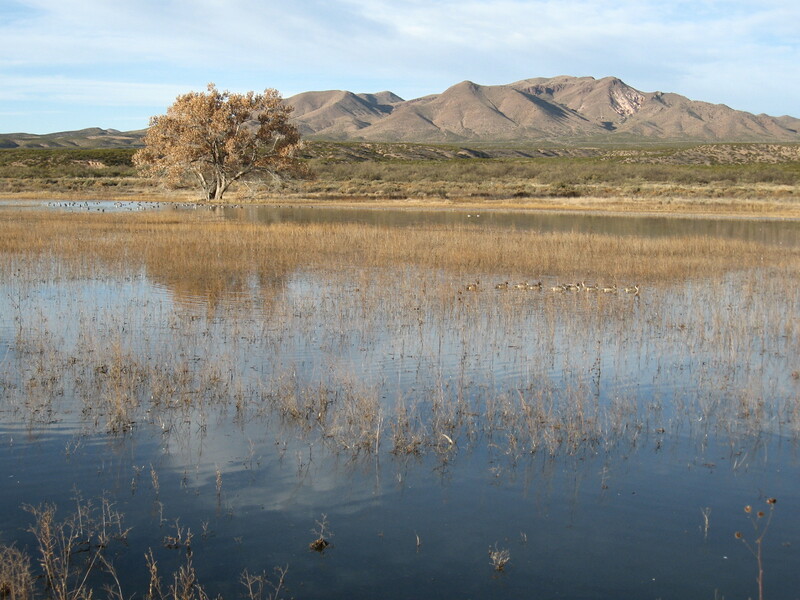 Getting to the know the landscape requires time and attention, just like people do. I do believe that this is one of the primary ways in which I can enrich my life, spending time outdoors that is. It definitely softened the day and melted away a lot a tension, and we really enjoyed a hot dinner upon returning home! 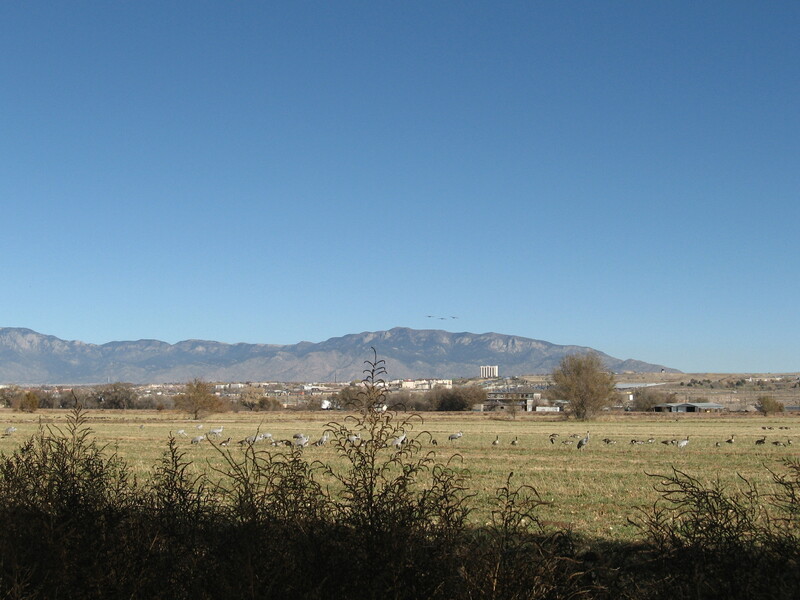 Thanks Albuquerque for preserving this open space. 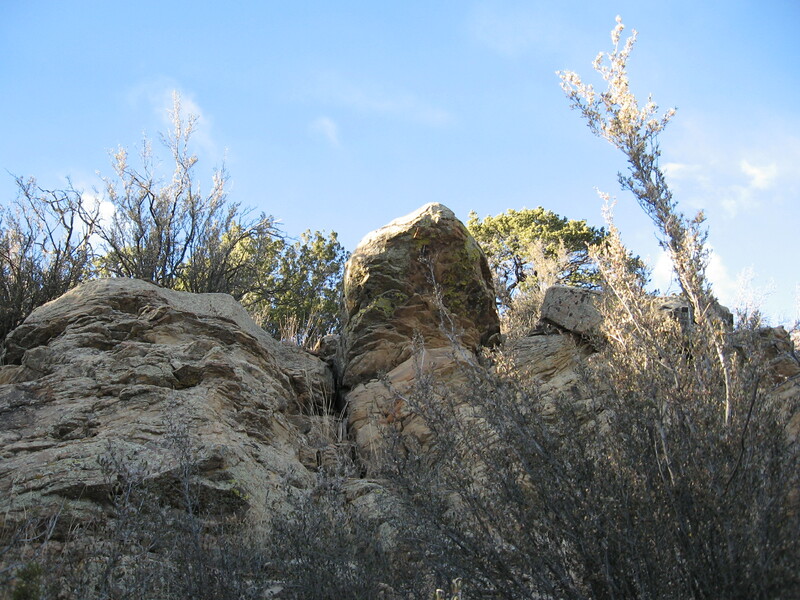 This entry was posted in Albuquerque, training, Walking on November 24, 2014 by bikeyogiblog. I met up with the “show and go” ride that meets at the traffic circle at the base of Roy Rd. this morning at 9am. It was fun! One of the biggest loses for me when leaving Flagstaff AZ was the departure from the awesome group ride that meets every Saturday there. The social energy and fitness you gain from good group rides is unmatched. But today I took a big step on my new adventure of becoming a bicyclist based in Albuquerque and I feel better about it. This ride is wonderful too just in a different way, which makes it exciting. 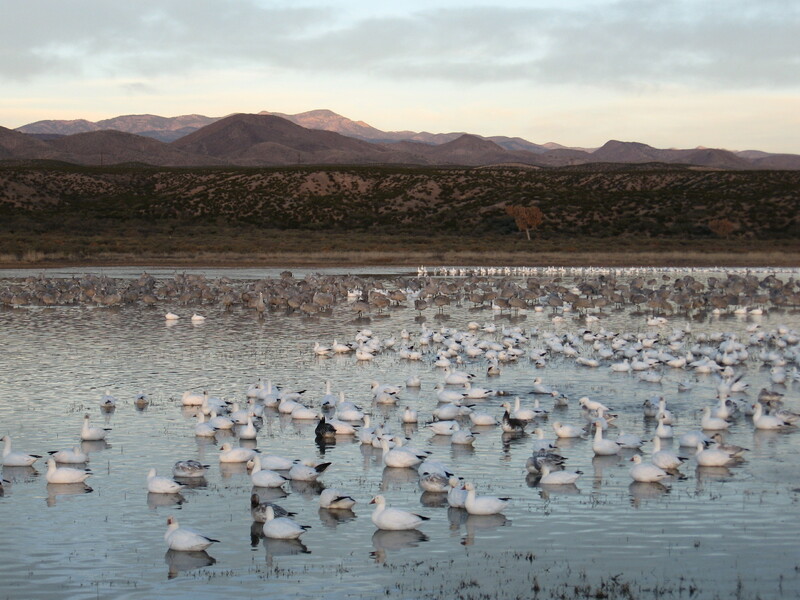 We had an impressive group of 25-30 people to start, a pretty good size for a chilly desert morning in November. 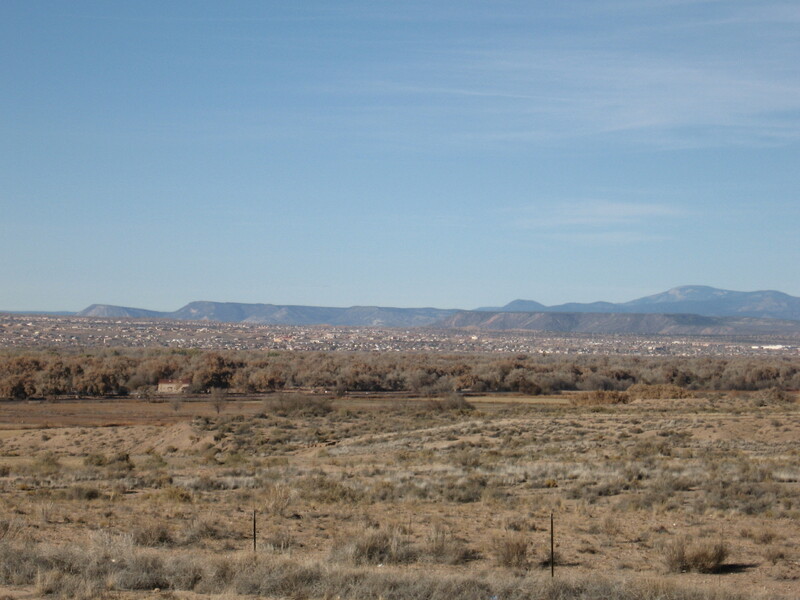 Many people come down from the 7,000′ elevation in Santa Fe and Los Alamos to enjoy temperatures about 10 degrees warmer at our 5,000′ elevation along the Rio Grande. Riding two abreast and heading north on 313 we were all trying to stay warm going into the chilly north headwind. I had a chance to meet the Martinez brothers native to New Mexico, and learned some perspective on this beautiful State. Many of the other riders out today I’ve met at races before and it was good to reunite with them. I also met coach Ryan Bolton, a former Olympian and student of Joe Friel. 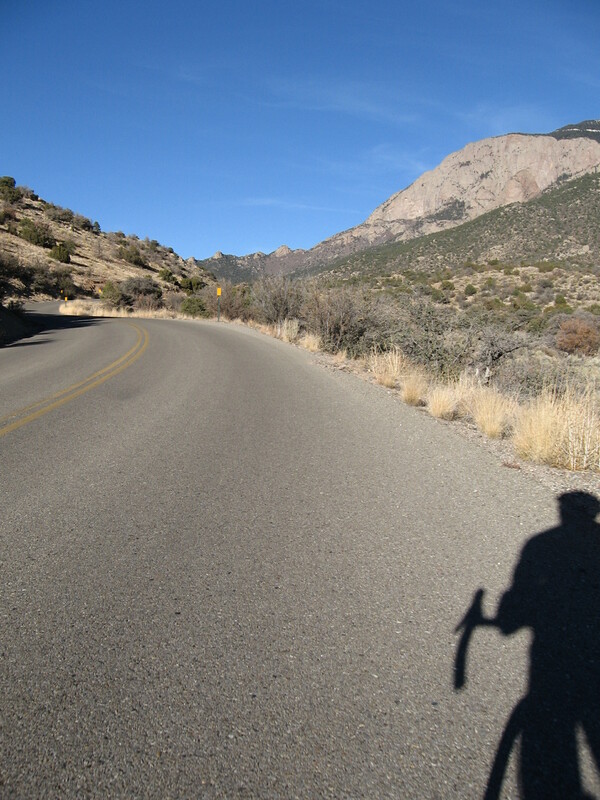 Ryan coaches athletes–particularly runners, including East Africans, and triathletes–in Santa Fe and one of his very strong triathlete clients named Ben was on the ride today. And just like the community group ride in Flagstaff I met a lot of dedicated family and professional people who also happen to be talented and dedicated endurance athletes (on winter rides the dedicated ones show!) who are very knowledgeable and enthusiastic about the local riding opportunities and cycling community here. 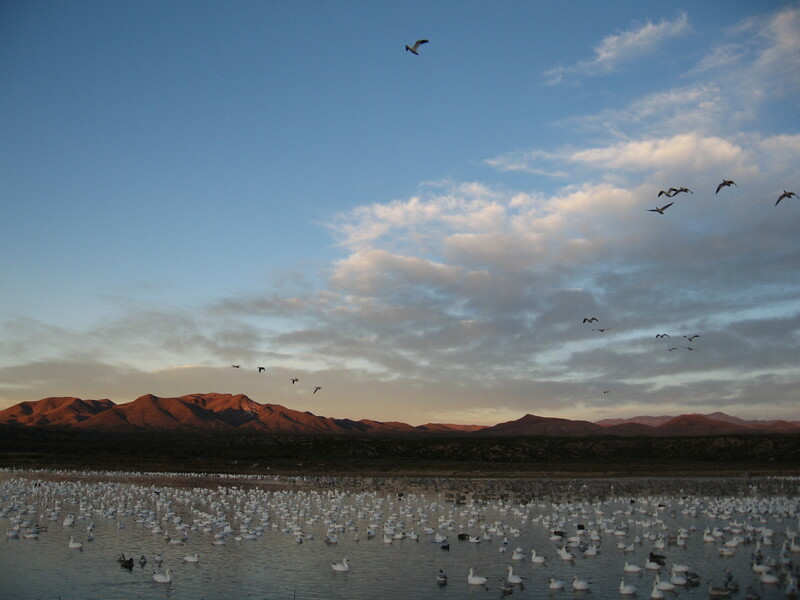 There is a warmth and friendliness here that you have to feel to believe. 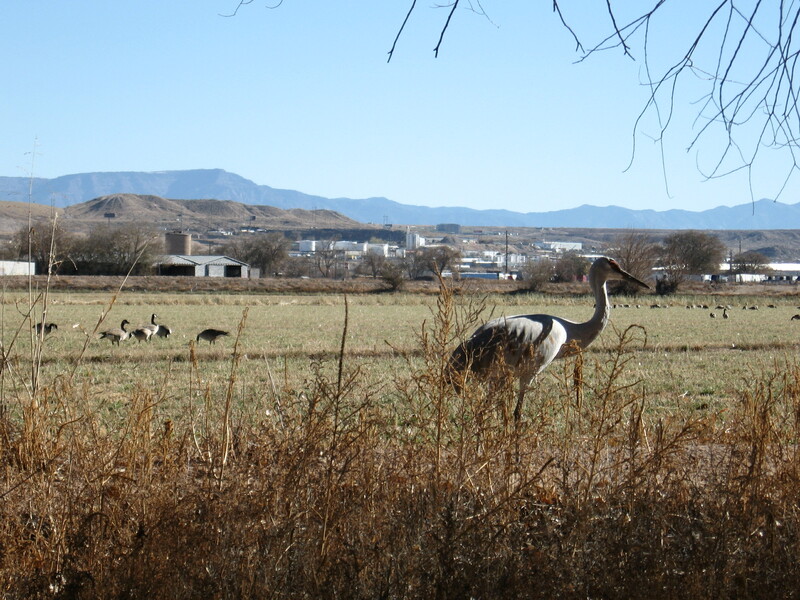 After swinging through Algodones on the old Camino Real we veered back south on the east side frontage road, which has stupendous views all around. I’d never been this way before. 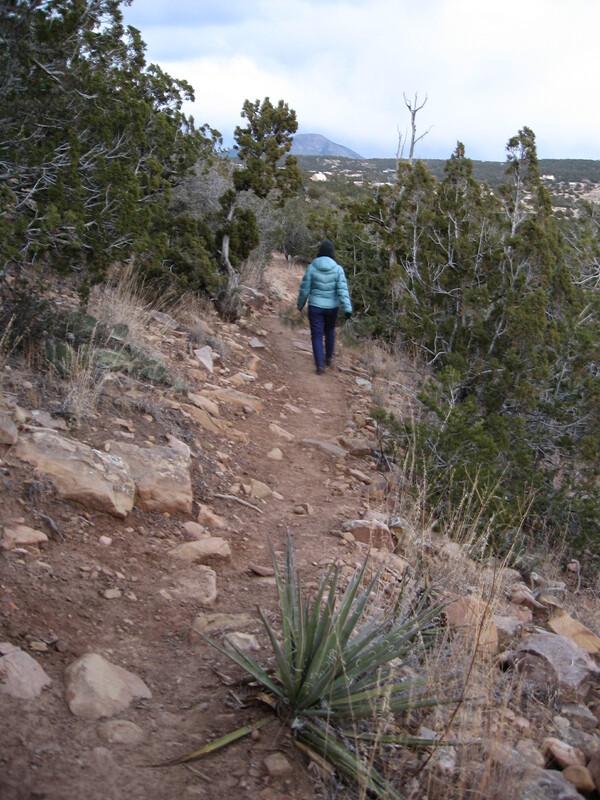 Then we took a left and started climbing up to Placitas. This is when the Mt. Evan’s hill climb champion made his presence known by accelerating up the steepest grades. 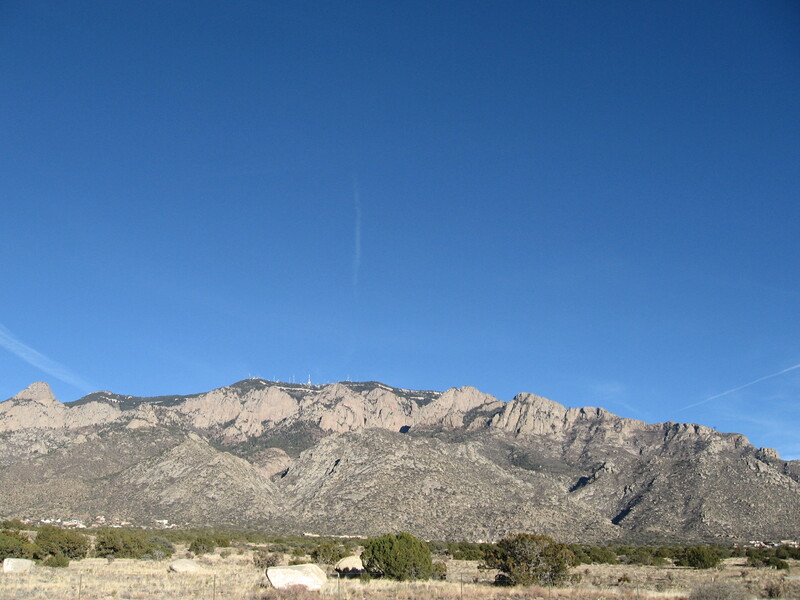 Fortunato is well known in New Mexico and regionally as one of the best climbers anywhere. 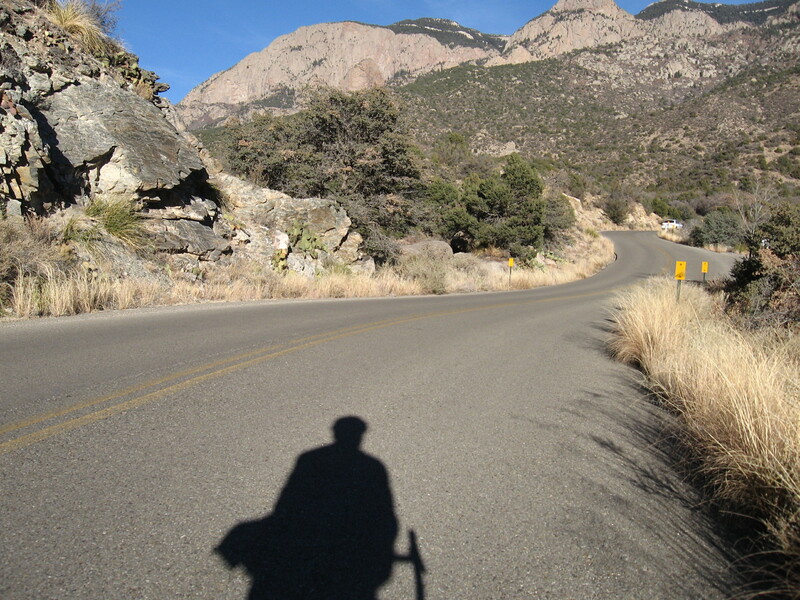 He exploded the ride apart on the way to Placitas until the turn around point where the road becomes dirt at about 6,400′. 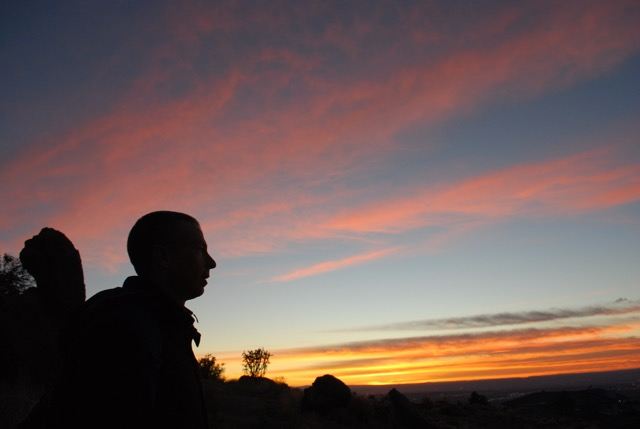 Pure climbing talent and an abundance of energy make Fortunato one of the best people to train with. We are lucky to have him here to show us where the mark is and to make us all strive in search of our best. 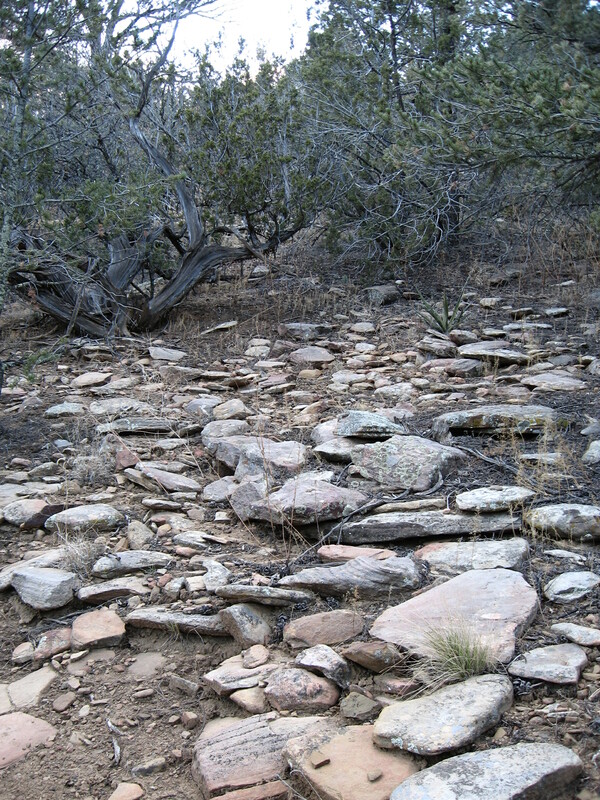 In Flagstaff we didn’t really have a climb in the ride but Placitas is definitely a climber’s paradise, although it is not steep enough to where a lone climber could dance and stay away if a couple of strong riders worked together to strategically reel the climber in over the spots where the grade eases. It is a gem of a training route. Even has a downhill sprint, which may entice some fast guys to come out. 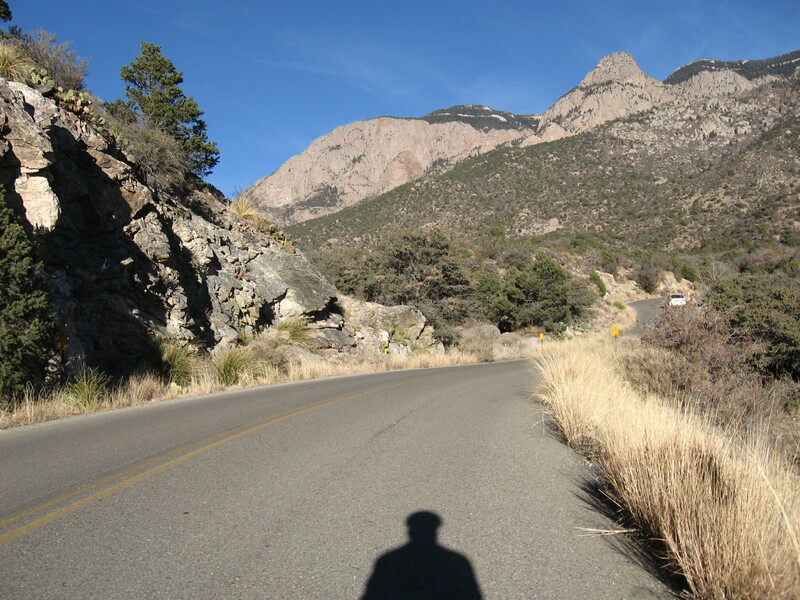 On the Flagstaff group ride sometimes the traffic was intolerant of bicyclists. We experienced some tight passing and honking horns here today. Groups take up much more space on the road than individual bicyclists do so motorist irritation is more pronounced on group rides. I didn’t see any motorist that waited behind us for more than a few seconds while waiting for a safe zone to pass. If anyone were having trouble getting by I’d gladly pull over when it was safe to do so to help facilitate a pass. The irritation is irrational but not trivial on our safety. All of the roads we used today were too narrow for bicycles and motorized traffic to share side by side (awesome graphic here on lane widths and space bicyclists require). Passing traffic should utilize the other lane completely when passing to give clearance, to avoid a squeeze pass which also endangers traffic traveling in the opposite direction, and to provide a buffer in case something happens in the group of bicyclists. This summer a national level rider I was training with slipped out his pedal and fell out into the road. Since there were no cars following too close or trying to pass us with marginal clearance, he survived. Many people try to squeeze past because they think the general travel lane is their lane. This is not an understanding that is part of the shared road paradigm. I am working on an educational campaign for drivers and bicyclists to try to improve the road environment. From the bicycling perspective I think we could have slowed down more through the art festival in Placitas. There were some pedestrians crossing the street and it seemed we could have modulated our speed better to display more courtesy. I don’t think we can show too much respect for our common humanity and do too much to safeguard one another’s dignity and health out in our shared public space on the road. Overall it was a great ride. 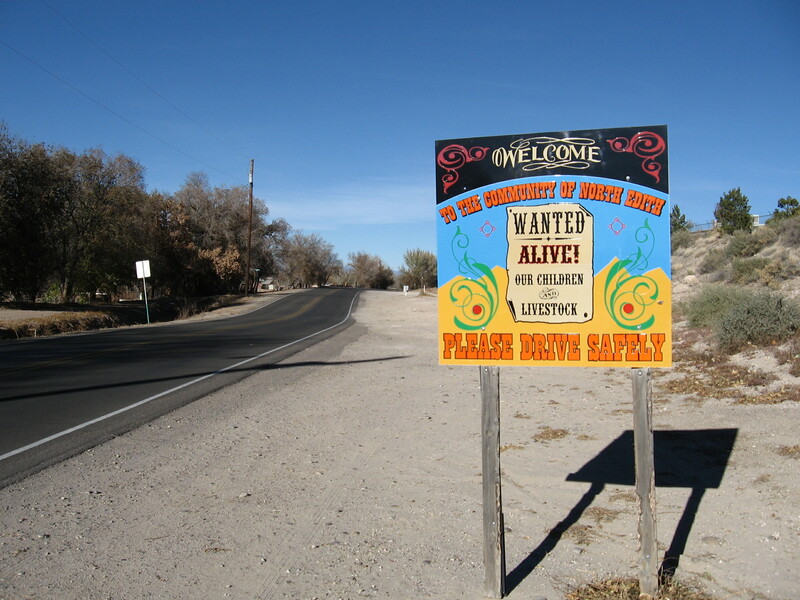 Thank you New Mexicans! Albuquerque rocks! I’m so glad to be here and look forward to more. 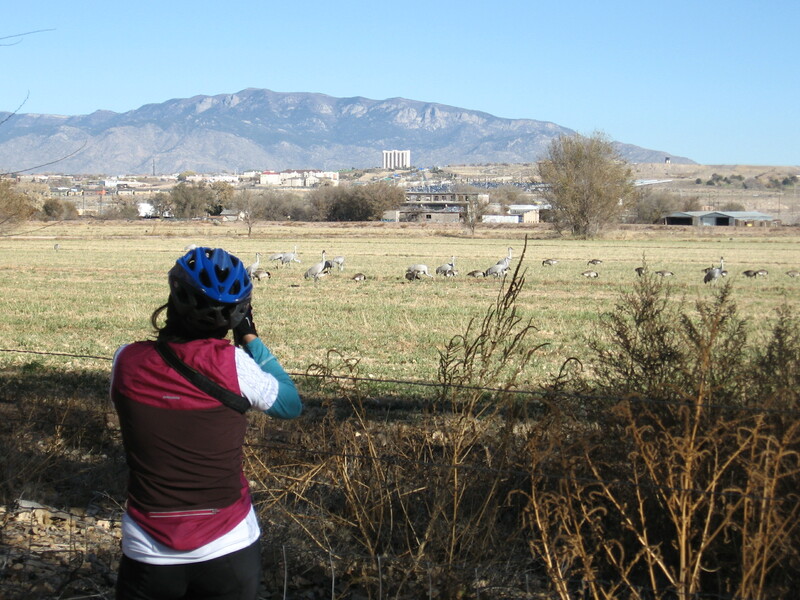 This entry was posted in Albuquerque, bicycle rides, bike culture, training on November 22, 2014 by bikeyogiblog. World Bicycle Relief has distributed over 200,000 bikes in the last ten years in Africa and the developing world. Bicycles are an “engine for economic and cultural empowerment” that afford people better mobility access to healthcare, education and business opportunities. It is phenomenal to read through their website and see the fundamental difference bicycles are making in individual lives and the power they foster for transforming entire cultures. 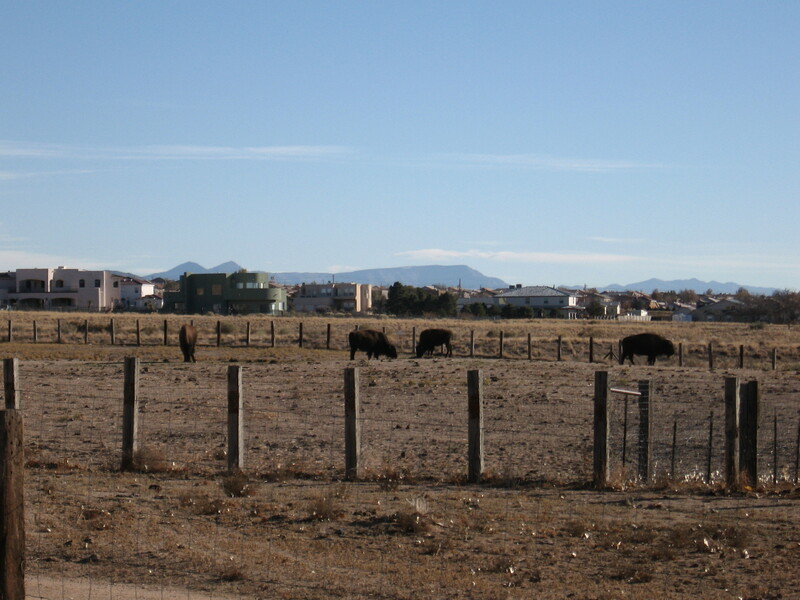 Here in Albuquerque and the greater Southwest we also have a significant population struggling to make basic ends meet. Bicycles are a key that open up affordable transportation and have an impact far beyond getting us from point a to point b. Bicycles facilitate essential exercise without having to carve out additional time to work out, elevate self esteem, and can even serve as a means of personal expression. Kids and adults can have so much fun decorating and personalizing their bicycles, and customization makes riding bikes more enjoyable. In Albuquerque we have a community bike shop called Esperanza that is helping people get rolling at a lower cost. In Flagstaff AZ where I lived the last ten years the university campus has opened up the Bike Hub “promote cycling as a health and sustainable form of transportation”. There are many similar programs including Every Kid a Bike in Las Vegas NV and Bikes for the World that get bicycles underneath people who need them at little or no cost, and provide some basic training and education. Developing the education, culture and infrastructure to further empower people to use their bikes is an important part of actualizing the full power of the bicycle. Often times new cyclists are intimidated to ride on the streets and don’t feel welcomed to be a part of regular traffic. Subsequently we get riders behaving in unpredictable ways. I am working on designing and delivering educational and instructional programs to empower people to ride with confidence utilizing the infrastructure and following the rules we have to accommodate bicycles. And also working on voicing my bicycling experiences to provide input to what kind infrastructure developments and modifications may work the best to facilitate quality and healthful environments for everyone that wants to bicycle. Working together we can be a big part of a world wide culture that fosters stronger human relationships through the power of bicycles. 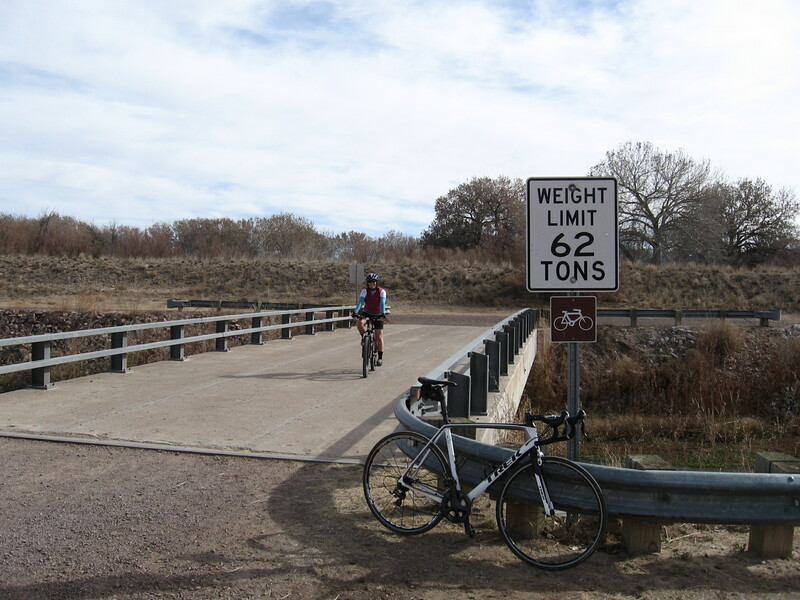 This entry was posted in ABQ bikeways planning, bike culture, Bike Org of the Month, Bike Sense = Design & Education, community news on November 21, 2014 by bikeyogiblog.